The Four Dog Fig Farm: Life Goes On. Okay, the wound is still fresh, but in the spirit of moving on, here are a couple of things that I'm really enjoying today. 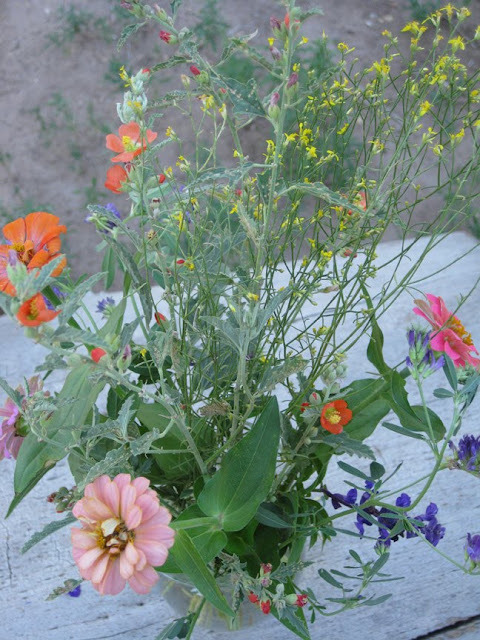 Garden annuals mixed with wild flowers. A version of this bouquet has been gracing both houses here on the farm for the past couple of weeks. We are always lax when it comes to planting cut flowers. Its something we always vow to remedy for the following year, but when spring comes around we're so busy planting vegetables and doing yard clean-up that we let it slide again. So when my garden zinnias just weren't profuse enough to create a full bouquet, I started wandering the property looking for filler. I'm loving it with the weeds mixed it. 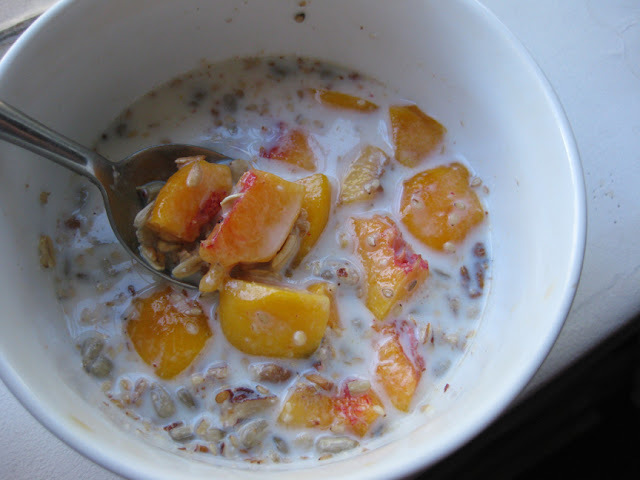 Homemade granola with fresh peaches. Peaches are without a doubt my favorite fruit. Nothing can top a perfectly ripe peach, but if you have to buy them in the store they are often just terrible. Peaches don't travel well! Lucky for us, they grow well in Albuquerque, and everyone shares fruit. These peaches are from a co-worker of my mom's and they were so delicious! The granola is based on this recipe from Heidi Swanson at 101cookbooks, except we use maple syrup instead of honey, pecans instead of almonds, and skip the dried fruit and coconut altogether. The great thing about making your own granola is that you can customize it and you know exactly how much fat and sugar has gone into it. Do you make your own granola?